I think this is a northern mockingbird, photographed in early morning in Big Bend National Park in Texas. Bird detail is seen much better in the largest sizes. Hope everyone has a really good Monday. Thanks so much for your comments on my flying blue heron. I really appreciate your comments. I certainly enjoyed looking at all your wonderful postings today. Is this a photo? love it and the composition of the framing and the fading out look. neat! I like your pp on this! Super shot... excellent PP work! Fabulous bird photos the last few days!! 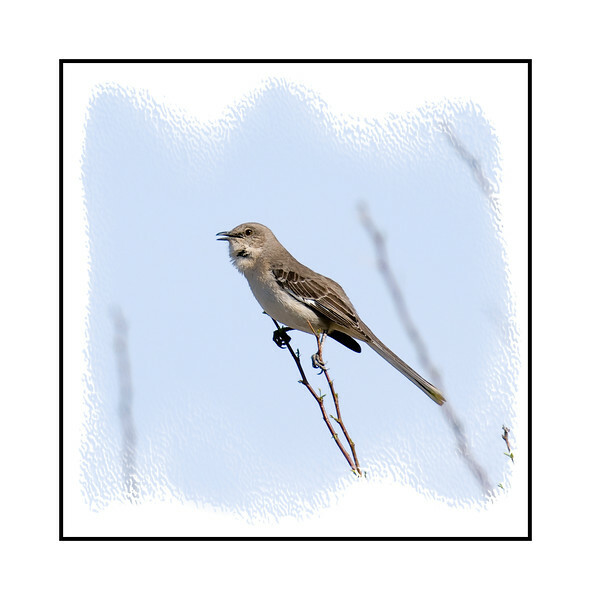 What a wonderful shot of the mockingbird with the throat feathers up while he's singing!